the need for new liquid aspiration each time. The medium is dispensed by simply rotating the wheels with a dispensing rate of 2.500 ul per rotation. The display ranges from 0.01 ml to 999.9 ml. The 360 rotatable discharges tube can be horizontally set from 142-200 mm and vertically from 210-370 mm. 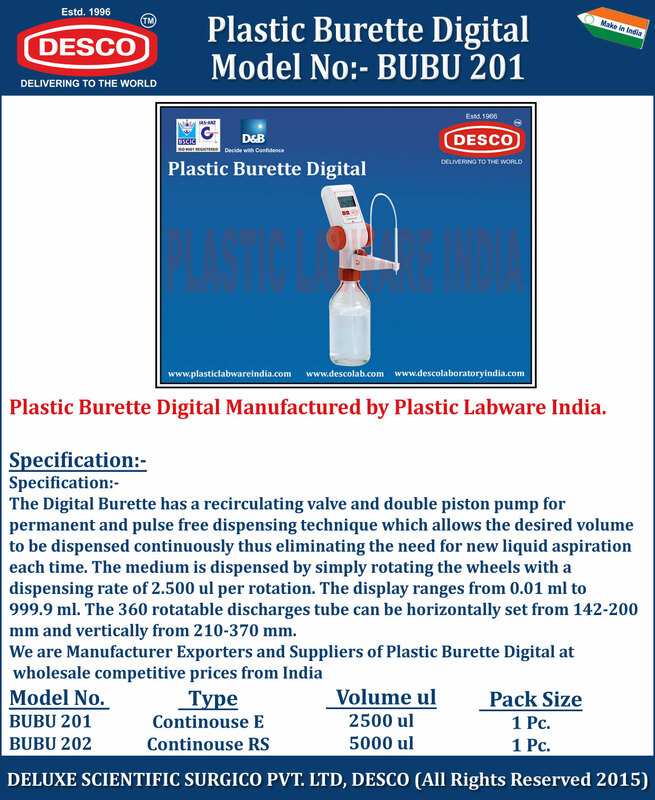 We are Manufacturer Exporters and Suppliers of Plastic Burette Digital at wholesale competitive prices from India. BUBU 201 Continouse E 2500 ul 1 Pc. BUBU 202 Continouse RS 5000 ul 1 Pc.